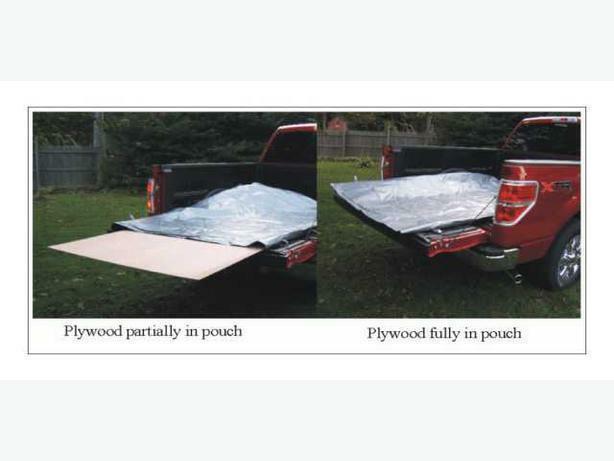 Looking for something to carry that expensive plywood in the back of your not-long-enough pickup truck? The Kerry-All Pouch is what you need! Kerry-All Pouches are made from woven polyethylene, 10 x 8 weave, with a thickness of 11 mil. They are silver on the outside and black on the inside, with a Velcro opening that is easily closed and opened. The silver outside is treated with an ultraviolet light inhibitor to prevent premature aging in sunlight. Shipping and HST NOT INCLUDED.